Hurricane Matthew made landfall in Haiti this morning, becoming the first Category 4 hurricane to hit the impoverished island nation dead-on in over fifty years. 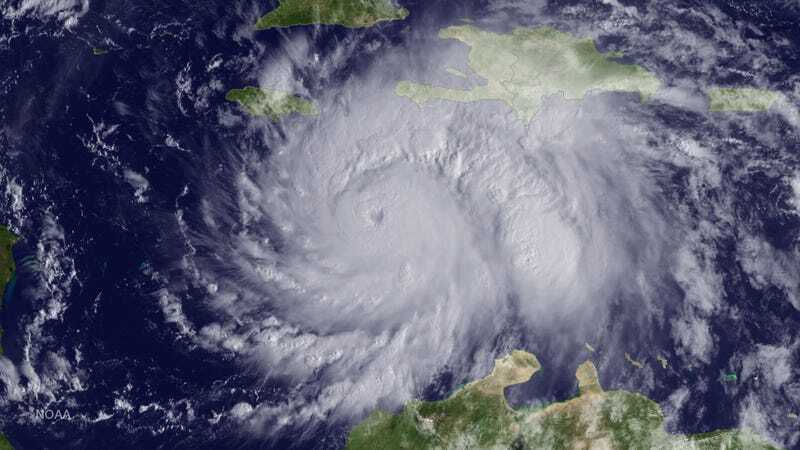 According to the National Hurricane Center, the “life threatening” storm made landfall around 7 am EDT on Tuesday, near Les Anglais in western Haiti. By that time, parts of the country had likely already experienced upwards of 20 inches of rain. More torrents today will increase the danger of flash floods, mudslides, and surges of 7 to 10 feet. Haiti, the poorest nation in the Western Hemisphere, is about the worst possible place a storm like this could have hit. The country has virtually no government. Approximately 50,000 Haitians live outdoors in makeshift shelters, having lost their homes in the devastating 2010 earthquake. Deforestation has left most of the nation stripped of trees and extremely prone to landslides. Cases of cholera have been on the rise lately, and floodwaters are likely to help the disease spread. In 2008, a spate of tropical storms and hurricanes—Fay, Gustav, Hanna, and Ike—struck Haiti one after another. All told, the storms destroyed tens of thousands of homes and affected nearly 800,000 Haitians. If history is any guide, things are going to get ugly out there. Update 9:40 AM ET: Photos and videos of the hurricane’s impact in Haiti are starting to roll in on Twitter, under #Matthew and #MatthewHaiti.